The print on the ring is very tiny. 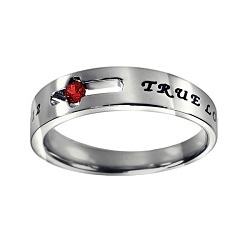 There is no reason to engrave the inside of the ring since it isn't really visible. This was a 13th bday present for my daughter. We bought this one for her one for her best friend. They took the pledge together after a day of kayaking and other outdoor fun! The quality is much better than I expected. They both wear them everyday, even to the beach, in the water, showering, etc... The lettering is coming of a little, but that is to be expected with as active as the girls are. At 16 we plan on upgrading to a white gold ring IF they are still serious about the pledge and I pray that they are. Thank you for making such a quality product in a such a simple style that our teens love! Well I ordered my purity ring that was embroidered with "True Love Waits" 1 Timothy 4:12 with my birth stone in the middle, and 2016 in the inside. When I received it I fell in love with it, It was so beautiful! When I had my purity ceremony today which was today January 31st 2016, all my church members said how beautiful the ring was! I had recommend your site to them, and I will continue to purchase. For it being my first time ordering from your site, it was a wonderful experience! Walmart thing is that it was on time I didn't have to call and ask where is it. It was here on time, and that's why I gave it five stars. It was pf excellent quality! God Bless!